"How do you say 'I Love You' to an answering machine?" 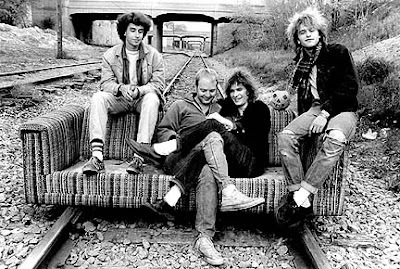 Originally bred from the Minneapolis punk scene of the early 80’s, The Replacements were always on the verge of “making it.” Led by Paul Westerberg, who later became rather well known for his single “Dyslexic Heart” from the movie Singles, they were a band that liked to party hard. Their live shows were known for drunken debauchery and inter-band squabble, which led to their demise. It’s a shame that The Replacements never made it big. Their punk roots provided for very angst ridden lyrical content, even as they became ever more poppy with their music. "Can't Hardly Wait" and "Alex Chilton" are classic songs in my opinion; I am transformed back to the early 90's whenever I hear them. The contrast between Westerberg's hardened voice and the upbeat melodies provides for that very distinctive Replacements sound.